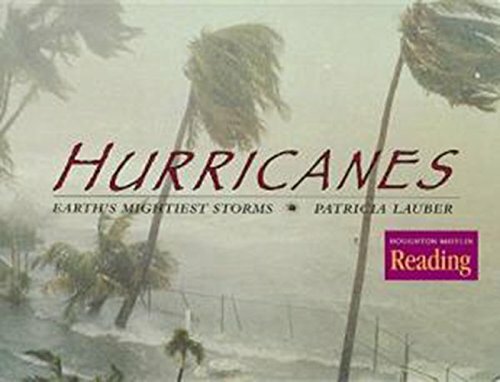 Hurricanes are huge heat engines. Something has to start the system. Often this involves the Intertropical Convergence Zone, the area near the equator where the air from the two hemispheres collides and rises. This area acts like a front, and low pressure systems can form where the line of convergence buckles. The global air circulation has air moving towards the Intertropical Convergence Zone from the east, and angling in from the two hemispheres. If the Intertropical Convergence Zone is far enough away from the equator, and it does drift north during the northern hemisphere’s summer and south during the winter, the Earth’s rotation will cause the easterlies to change to a westerly direction, having air pass each other as it moves into the Intertropical Convergence Zone. The collision of the air from the two hemisphere causes the air to rise, and triggers severe thunderstorms. Inro Image: Allowed by the Amazon affiliate program. The book is shown below. The reason air deflects to the right in the northern hemisphere and the left in the southern hemisphere is the Coriolis effect. The Earth rotates on its axis every day, and the air on the Earth’s surface must travel around the world with the spinning Earth. Air moves faster the closer to the equator it is, so air moving south in the northern hemisphere moves into an area where the Earth literally outruns it, and air moving north literally outruns the Earth, hence the deflection. This causes air to deflect as it approaches lower pressure, so low pressure have a counter-clockwise rotation in the northern hemisphere. This same effect causes high pressure systems where air descends from aloft and spreads out to rotate clockwise. Basically, a hurricane needs rising air. The reduction of pressure invites other air to spiral in, and it too will rise. The real fuel is water. As moist air rises it cools and is subjected to lower pressures, which cause the air to have a reduced capacity of holding water vapor. When water goes from the gaseous state to the liquid state it releases heat, which expands the rising air and makes it rise even higher, all the while condensing more water and further heating the air. When the air gets high enough, freezing the liquid water further releases heat and aids in the convection. The initial thunderstorms can be simply associated with an Intertropical Convergence Zone disturbance, or might be associated with an uplifting of air passing over an island. The Sahara desert sandstorms put electrically charged sand high in the atmosphere, which attract water and can trigger a thunderstorm cluster. Or, a warm area of ocean might have air passing over it rise, just like a hot parking lot can send air aloft. This too can trigger a cluster of thunderstorms. And, the Gulf Stream is a hotter than the surroundings water area. 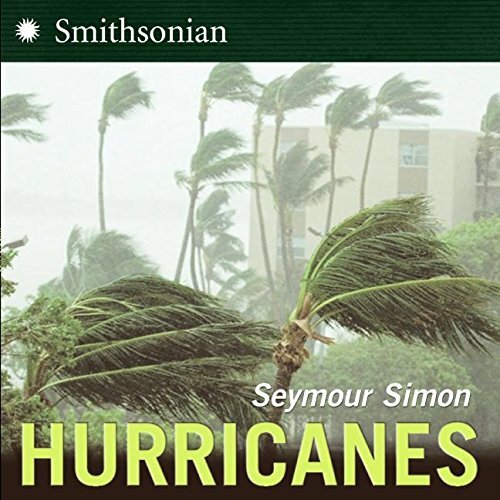 If it were not for friction, the inflowing air would soon shut the system down, or the when coupled with the Coriolis effect the air would go in a circle with the system unable to grow to hurricane strength. Friction slows the air, so the deflection is lessened, but the low pressure attracts air with the same force. So, the air spirals in, and the system is able to grow. To understand the path we must consider the global air flow. Air at the equator rises, and after going to roughly thirty degrees latitude it sinks. This causes high pressure to form roughly thirty degrees from the equator. The air flows out from high pressure cells and moves clockwise. The individual cells often look elliptical, so the storm can be steered along the high pressure cell, first eastward, then slowly tracking more northerly, and finally westerly, giving the appearance of a parabola. The high pressure cells can split and merge. Other steering is caused by fronts and anything else that influences air movement. When the high pressure cell ends at sea the storm will often turn before reaching land. If the high builds and covers the coast or get close to the coast the storm may well enter the Gulf of Mexico. 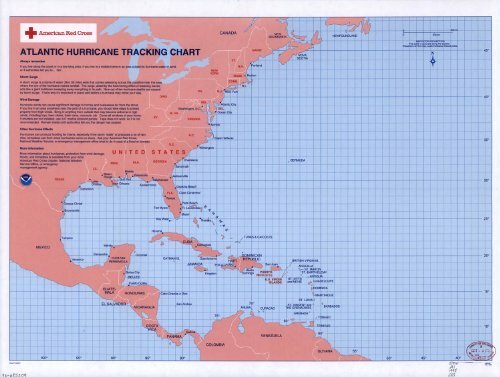 Map Poster - Atlantic hurricane tracking chart - 24"x18.5"
The air rotates as the system as a whole moves along. On the right side, the storm movement and rotation add, so the wind is stronger. On the left the two movements oppose each other, so the net wind is reduced. Another problem with the right side of a hurricane is that when a hurricane encounters land the forward right quadrant often triggers tornadoes. Still another problem is that right of the center the wind blows towards the coast, so a storm surge should be higher. The wind piles water up at the coast, and the inward flowing air causes a bulge in the ocean in the center of the storm. These can produce a storm surge which depends on the wind speed and duration, and the contours of the coast. Normally occurring tides can also contribute to a storm surge. 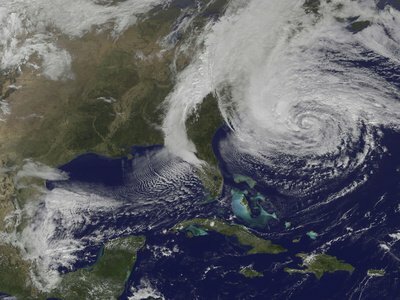 Hurricanes move slow enough to allow for a long warning period. While intensity of the system can change, the path often can be forecast with a cone of uncertainty days in advance. So, for those unfamiliar with hurricanes, visiting a area where they can have an impact should not be a deterrent. You should have plenty of warning if a problem occurs. Fantastic article . Incidentally , if others is requiring to merge some PDF files , my colleagues found a tool here http://www.altomerge.com/. 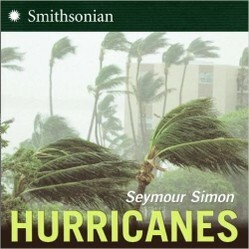 I learned a lot about hurricanes today...drank a whole cup of tea while reading! Your knowledge on the subject is apparent. Thanks for sharing. We hit 100 degrees yesterday, so some snow would be nice right now. But that seems extreme. We now have the phrase Blizzicane in New England. It's basically a winter hurricane. I was on Cape Cod two years ago when we had 70 mph sustained winds and 95 mph gusts. The whole while it was throwing snow instead of rain. It was a very scary storm. You and I, Veronica, live in broadly the same region, North West England. Here we rarely see a hurricane. When one hits Britain its track seems to be up the English Channel, coming ashore over the mid South and then tracking North over London, losing power as it goes. In the 1987 Hurricane we in the North West got the side of it, with a night of strong winds, but no real damage. The one exception to this was when a strong storm just below hurricane force came from the North Atlantic, and it caused some damage in our region, about twelve years ago. This sort of article shows me just how much in life I have yet to learn. Fascinating and well explained. Obviously in the UK's frozen north, we are unaccustomed to hurricanes but they seem very frightening to witness. The satellite pictures are particularly useful. 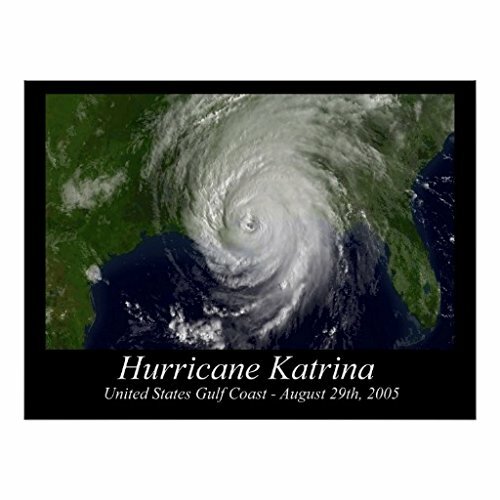 Thanks, years ago as a physicist I attended a hurricane conference. My physics allows me to understand how things like hurricanes work. And, I have to translate science for students regularly.